Court official website of www.jharkhandhighcourt.nic.in before the closing date of 23-10-2018. There are total 73 Assistant and other posts in this JHC Recruitment 2018. Selection for this Jharkhand High Court Recruitment of Assistant and other posts will be based on written exam and skill test. More information regarding this Jharkhand High Court recruitment of Assistant and other posts selection process, how to apply online and other details are given below. 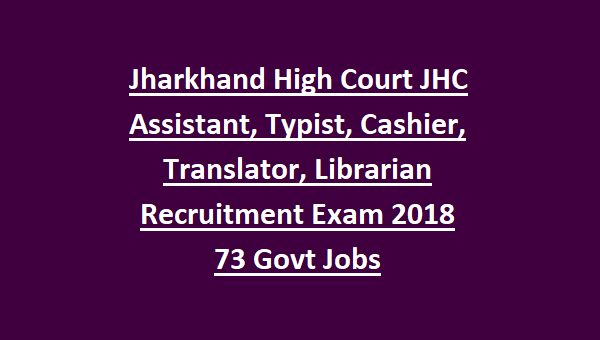 There are total 73 Assistant, Typist and other jobs in this Jharkhand High Court Recruitment 2018. For all the posts age limits are 18-35 years for General Male candidates. For General Female, BC Male and Female candidates upper age limit is 38 years. For SC/ST candidates upper age limit is 40 years. For Assistant Post: Degree qualification with sound knowledge of Computers usage and typing. Typist - Degree with Typing speed of 40 WPM in English. For All Category Candidates Fee is Rs.500/-. For SC/ST candidates application fee is Rs.125/-. Candidates will be selected based on written exam and merit list. Candidates merit list will be prepared on basis of merit in written exam and skill test. Download Exam Pattern and Syllabus here. Online applications are accepted for this Jharkhand HC Recruitment of Assistant and other posts through official website of www.Jharkhandhighcourt.nic.in before the closing date of 23-10-2018. 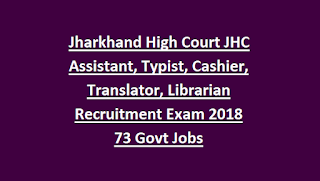 Jharkhand JHC Asst jobs Exam Pattern and Syllabus, JHC admit card, skill test details and other details are available in this website only.